Amy Walsh-Harris : "1st Layer. 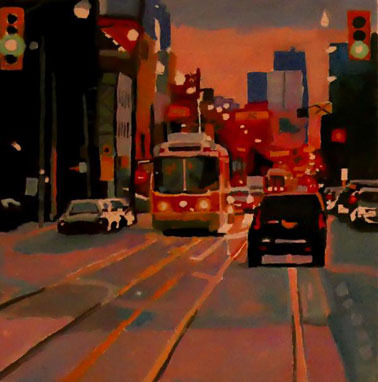 Heading west on Queen E. oil on canvas 12''/12''." Until recently Toronto’s new mayor, John Tory, was widely loved in opinion polls. As in “Tory’s approval rating remains strong” (April 13), and “Still in the honeymoon stage … Mayor John Tory continues to enjoy a soaring approval rate” (May 8). Yet it seems that the worm has now started to turn, as it inevitably must. In retrospect, the whole thing seems so bizarre that I can’t quite believe it actually happened. I keep thinking I must have just fallen asleep on the streetcar, and dreamed all the subsequent streetcar fun. 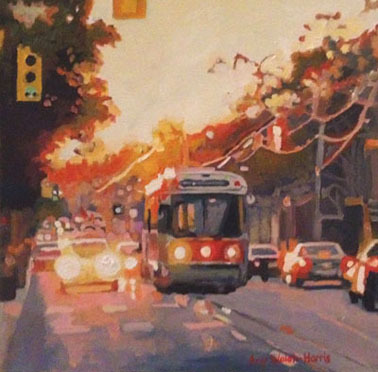 Around Kingston Road, I think, the streetcar driver’s voice came over the car’s sound system. He was telling someone that if they didn’t change their ways they’d have to get off. As I think about it now, however, I don’t feel the driver who stood up for the decorum of his vehicle in this way was the same driver who later embarked on “streetcar fun.” I don’t have an exact memory of it, but the drivers must have changed at the Connaught yards, as they often do. In any case for much of the trip I was in a contemplative mood, largely oblivious to the world around me. It was a nice night, now well after dinner. I was on my way to the jazz and blues bar one stop after University. I was just sitting back, looking out the window at the south side of Queen Street, taking it all in, enjoying the motion of the streetcar. 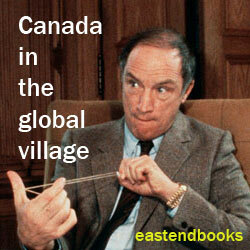 Then, around Carlaw and Pape, there were suddenly many motor bikes parked neatly at the edge of the road. This surprised me out of my tranquil oblivion. And, accidentally or otherwise, the bizarre part of the ride seriously began. 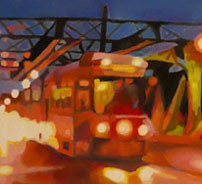 The first sign was just a brief moment when the streetcar lights went off. Followed by a gentle burst of the quiet (mostly?) 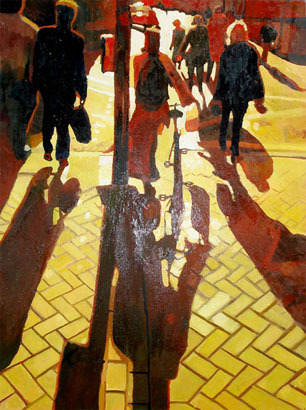 women’s chatter often found on public transit — “O the lights went out … I wonder what that was” … and so forth. The beginnings of an answer came soon enough. The driver’s voice on the sound system asked if anyone wanted to hear a joke. There was enough of a positive response to lead him on. He went on to instruct his passengers. He would turn off the lights. And we would all start clapping. Then he would turn the lights back on. And we would suddenly stop. 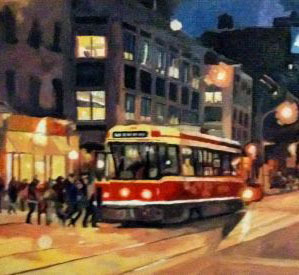 By the time we had crossed the river, and were approaching the old city downtown, in the romantic glow of a cooler but not unpleasant late spring evening, the trick had been perfected to the point where the driver could play it on new riders with almost dazzling effect. I still did not participate in the clapping myself. But I’d say that a good half of the people on the streetcar did (again, especially the two cute young girls I could easily see across the aisle and up a bit from my single seat). Each iteration of the lights-off-clapping event was followed by energetic laughter when the lights were turned back on. And I finally found myself laughing too — at the same time as I grew more concerned about my own and everyone else on the streetcar’s safety. I was quietly pleased that I did not have all that much further to go. But it was also difficult not to join in the wild enthusiasm about such a bizarre streetcar journey that so many of my fellow passengers seemed to share. 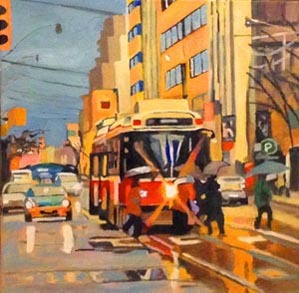 Queen streetcar in the rain. Once the car was in the heart of downtown, past Church Street say, the driver and participating passengers pulled the lights-off-clapping trick several times as new riders arrived at the various stops. I got to the point where I was looking for reaction on new faces when the lights went on. Inside the jazz and blues bar at the corner of Queen and St. Patrick I suddenly forgot about the streetcar fun, catching up with friends, waiting for the band to start. Then all of a sudden I remembered about the streetcar fun on my earlier journey. And about this same time a few people started dancing to the band’s music. Odd if not exactly unprecedented for a jazz and blues bar these days. But then I thought that when jazz actually was at least very close to America’s popular music, it was a dance music. If people were inspired to dance to the jazz I heard that night (which did have a more or less steady, rolling rhythm, as in George Benson and all that), it had to be a good sign. Jazz needs to become a music that people can dance to again. I am much less certain just what to make of my streetcar fun journey. I think what I finally think now, with some distance on what happened, is that Rob Ford is no longer the Mayor of Toronto. But something about him is lingering on, even in the heartland of the old city where even at the height of his popularity he was not all that popular. As I think about my last long look at the driver as I left the streetcar at the jazz and blues club, he looked like someone who might have been inspired by Rob Ford. I think too that if Rob Ford had been along for the streetcar fun ride the night before last, he would have enthusiastically joined in on the clapping, and enjoyed the whole thing. If our new Mayor John Tory had been along, he’d almost certainly have sent the streetcar driver home in a taxicab — and then driven the streetcar himself. 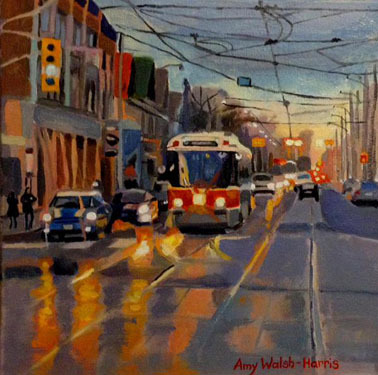 NOTE FROM COUNTERWEIGHTS EDITORS’ : In looking for illustrations for Mr. Bunting’s piece here we were thrilled to discover the Toronto streetcar art of Amy Walsh-Harris. And we have taken the liberty of showing some of Ms Walsh-Harris’s work posted on the net, to flesh out L. Frank Bunting’s literary thoughts. 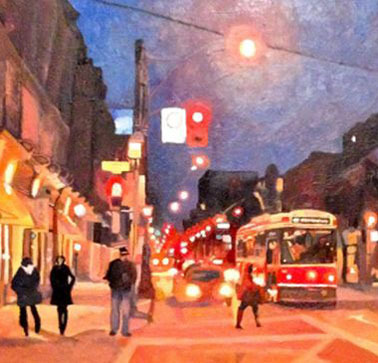 She had a recent exhibition (28 March 2015) at Wychwood Barns in Toronto. 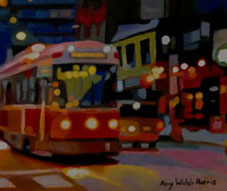 She also has paintings and prints for sale and can be contacted through her website page Contact Amy Walsh-Harris. 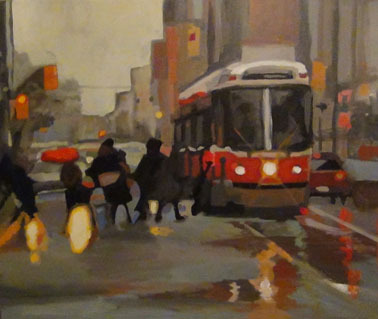 She will as well be at the Riverdale Art Walk in Toronto this weekend, 6 & 7 June 2015, at Jimmie Simpson Park (right on the route of the Queen streetcar, not far east of Broadview) from 11am-6pm — on both Saturday 6 and Sunday 7.